The site gets used quite a bit, last stats reported over 8100 feeds cached in a 24 hour period (the cache is emptied every 24 hours) and a bit of googling on the embedded code suggests it might be use on more than 16,000 web sites. It has a firm spot on the edna site in Australia. For some time, the code has been sitting rather desperately alone on eduforge, so this is my attempt to drum up some interest among RSS junkies and PHP smarties who may be interested in “taking over” parentage of the software, hopefully improving it. Possible move from the parser from MagpieRSS (not updated since 2005, and even the blog’s updatesare more than a year old) to a better parser- SimplePIE? 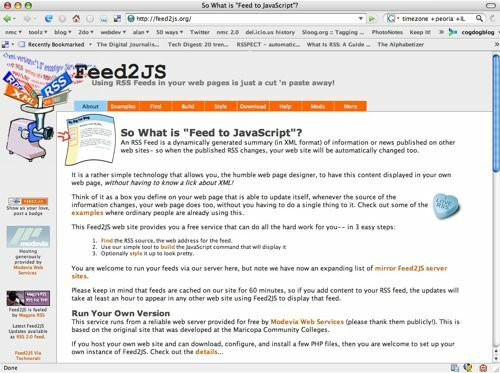 As is Feed2JS cannot handle the feed format Blogger changed to a whle ago. Rewrite the preview and code generation parts of the web site to something more elegant with a hint of AJAX. Develop a system for managing mirror sites that does not involve manual cut and paste- some way of locating a master list of sites, and jumping to another site if one is not responding. A must rule on any changes however, i that any revamp of the code must do so in a matter that does not break it for any previous users. I have done this since the start. 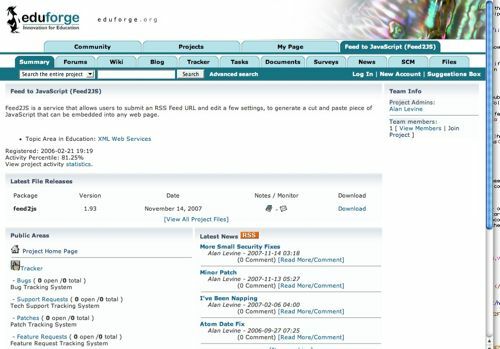 There is certainly more activity that can be rounded up at the eduforge site, such as the forums, a wiki… again, I’ve not bothered to do a great job of organizing the site, and honesty, have not done an open source project management. Take this off my hands please! As some background (and this took a lot of archeology excavation from my own blog), in early 2003 I was looking for some ways to have automatic filtering of content from a project at Maricopa I was working on, the Maricopa Learning eXchange, a collection of projects, best practices, even so-called “learning objects” developed among 10 sites of that community college system. I was looking for a way the information might be automatically be available as some sort of “widget” (did not call it that back then), a site such as Phoenix College could use so its own web pages could display the latest content that had been added to the larger collection, but include only the ones from PC. Then crazy things started happening as more people began using it. Like getting those panicky emails if the feed failed or my web server was not available. It got rather scary to think people were counting on this working! This was running all on an Apple XServe in my office at Maricopa, which eventually was moved up into the main server room. It was good timing I moved it to its current site http://feed2js.org in late 2005 as I left Maricopa in March 2006 for my current gig at the NMC… and that XServe was pretty much ignore or decommissioned by the IT staff with no one around to fend for it or tend to it. At this time, I am overwhelmed that the tings till works and people use it, and I don’t get too much email about it. I did get some help this year from 2 keen people who helped close some security flaws, but again, I am not seeing much opportunity to be heavily involve. So I am looking for some interested programmers who might want to take a crack at cleaning up the code, and even someone who might be interested in leading the effort; I will gladly hand over the keys to the forge to the right folks. I’m tempted, but am also a bit worried about being able to give it the love it so much deserves. I will throw this in, though–I’ve been playing with SimplePie a bit lately, and have found it very happy and easy to work with. (A few edge cases weren’t quite so direct, especially when it comes to some nuances of tags from different generators, but overall that’s been deal-withable). I’ve been especially happy with its feed autodiscovery, and it seems to have some very nice methods for a variety of data-wrangling. Good luck, Alan Levine, with getting help with this project. I use feed2js on my site and am extremely grateful for it. I notice that over the past week or two, any Google News feeds I have used with your service seem to be failing, although they test OK in your preview. Why this should be, I don’t know (I’m not technical), as Yahoo! News feeds work. Anyway, best of luck. Thanks Pip. I dont have an off the shelf explanation for why Google News Feeds are failing. If you can send me the feed URL that is failing, and the URL for the page where it fails to embed I *may* be able to take a look.